to change the way your customers use their phones - forever! Pilgrim's partners are some of the most respected telecommunications and marketing companies in the world. They represent a wide range of size, location, technology, and focus. Some partners use Pilgrim as an ICX carrier alone, others for unique, customized, telecommunications services; many take advantage of our full range of services including billing and mediation, customer service, and marketing. Whatever the need, Pilgrim maintains its focus on our partners' goals and applies the appropriate technology to achieve them. We began developing partner relationships over a decade ago and are delighted that an overwhelming majority of our original and subsequent partners continue working with us today. Pilgrim's services, including Connections™, Voice Personals, live forums, and teleconferencing, reach a vast audience by telephone, making over 1.9 million impressions to an audience of over 800,000 consumers per month. Operators and their customers can instantly access Pilgrim's established national and international critical mass of active, interesting community members. Additional service features boost revenue and retention and reduce churn. Because our products are stable and proven, their addition to any Operator's offering can reliably stimulate new customer growth and retention. Ultimately inclusion of our services increases usage and revenue streams while satisfying an expressed consumer lifestyle desire. Pilgrim's portfolio of conversational services allows users to anonymously instant voice message and chat live with others. Since voice is more convenient, flexible, and intuitive than web or text; Pilgrim's services can reach a larger audience. Competitors can offer SMS-based messaging, but no one in the market today provides the robust feature set and capabilities that Pilgrim does. Pilgrim's Connections™ suite of services adds additional value to any operators' product offerings while staying within existing guidelines and contracts. To clarify, Pilgrim's Connections™ services are focused only on connecting customers to each other, and neither Pilgrim Telephone nor our partners provide content. The user experience is such that each user manages their own activities. Pilgrim works with our partners to create a set of chat and Connections choices to serve wide-ranging interests. Pilgrim applications provide an easy opportunity to meet the needs of a specific customer segment that is willing to pay for premium services to communicate anonymously in an active and fun community with people from the US and around the world. These services generate long hold times, large revenues, and reduced customer churn. In addition, Pilgrim provides a field-proven solution that meets Telco-grade requirements with minimal capital expenditure and immediate startup. Pilgrim's turnkey solution has minimal operational impact. The Pilgrim Global Service Provider ASP model is designed to offer Operators the ultimate combination of a feature-rich system with industry leading service provider capabilities and infrastructure. No other company can approach our product superiority, our invested commitment to Conversational Services, and our marketing support and expertise to ensure the success of our solutions. Pilgrim provides the 800 numbers, long distance service, customer registration, billing, as well as pre- and post- sale customer service. Pilgrim has accurately priced conversational services for over a decade. Rates are set based on premium prices commanded for each service. Through Pilgrim's billing platform, our partners can offer customers LEC, Credit Card, and Pay by Check billing options. To provide our customers with accurate, reliable and convenient information, Pilgrim provides raw data as well as analysis. Knowing that it is not sufficient to simply generate and analyze Call Detail Records (CDRs), Pilgrim engages in numerous additional activities to provide good and effective reporting. Pilgrim's report generation is based on a set of tools designed and customized by our in-house engineers to provide information and analysis. Reports can be delivered via web interface, email, and/ postal service. Pilgrim has the flexibility to create additional reports in a format and delivery schedule convenient to partners. Pilgrim's Connections™ can be custom-tailored to fit any partners' requirements. Here are examples of how Pilgrim's customization can enhance a unique experience for our partners' customers. If desired, the entire program can be scripted and voiced to present the image a partner wants to project. This could include using specific celebrity voices, or 'trademark' voices customers' associate with the partner through their advertising. An operator's customers would hear introductions, instructions, and menu prompts entirely in a customized voice (or voices), and, at the same time, would have access to the global community of callers. 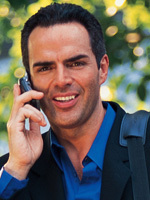 Services can be presented in a specific US regional dialect, offering users a unique "look and feel", including either nationally preferred accents or regional dialects depending on the caller's home location. Because some customers are bilingual, Pilgrim offers a unique experience for customers requesting bilingual communication. Users have the option of calling into the platform and leaving either a Spanish and/or English profile. These users can instant voice message and chat with people who are also bilingual. This can also be offered with other languages as well. Pilgrim can create a user interface that allows users to choose the geographic orientation of their new friends.